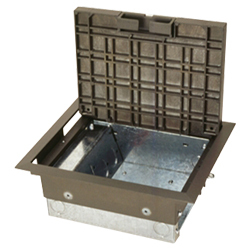 The AC8104 box has a 4" [102mm] depth design with an extra 2" [51mm] of width for additional wiring capacity. These boxes can accommodate two duplex power receptacles on one side. NOTE: For custom options, consult factory. All boxes are sold with one power plate. All communication plates sold separately.